None of these, if you ask me. To me, Concrete is a sweet and creamy, yet industrial-smelling fragrance, sort of like warm custard in a wet alley near freshly plastered walls. It’s friendly and easy to like, but also unfamiliar. 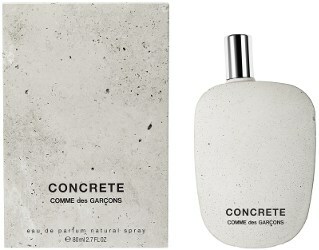 That combination — easy yet with its own intriguing character — is so rare these days that I’d be surprised if Concrete isn’t one of the year’s hits with perfume lovers. Nose Nicolas Beaulieu developed Concrete. Comme des Garçons is coy about listing its notes, only adding rose oxide and a reference to the company’s “spice signature” to the “deconstructed sandalwood” its marketing materials tout. On spraying on Concrete, the first image that comes to my mind is fresh plaster. Plaster has the same chalky creaminess — and isn’t that far from the idea of wet concrete, come to think of it. Embedded in the plaster is sandalwood’s warmth without a particularly woody vibe. The plaster smells like it’s molded on a rod made of surgical steel, but with the intimate and slightly medicinal feel I associate with saffron and oud. And Concrete is sweet. Not sugary sweet or sweet like vanilla or amber, but sweet with a hint of spice, like sandalwood. Once Concrete has settled a few seconds after spraying it, it doesn’t change much. It has a moderate sillage and lasts about four hours on my skin. I’ve been able to wear Concrete in the morning and shift to something else in the afternoon without worrying about Concrete getting in the way. It’s impossible for me to impose a gender on Concrete. I think it could be worn comfortably by the most macho or girlish person, as long as that person was willing to chance a fragrance unlike anything else on their dresser. A discussion of Concrete wouldn’t be complete without mentioning its bottle. Concrete is packaged in the traditional Comme des Garcons flat bottle that lies on its side, only it's encased in a smooth coating of — you guessed it — concrete. The bottle I borrowed for testing even has a few bubbles from where the concrete has dried. To complete the industrial feel, the bottle, in turn, comes in a bubble-wrap pouch inside the box. Concrete is that gratifying combination of novel and easy that’s so hard to find these days. I don’t “love-it-have-to-have-it” (admittedly, I’m getting jaded), but it’s a pleasure to smell something with so much personality that’s also so welcoming. Don’t just take my word for it, try it yourself and see. 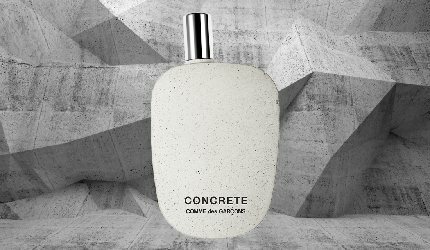 Comme des Garçons Concrete Eau de Parfum is $165 for 80 ml. For information on where to buy it, see Comme des Garçons under Perfume Houses. Thanks Angela! I’m looking forward to trying this and glad it doesn’t seem too much of a novelty scent. The creaminess sounds good. I have Smell Bent’s Artist Studio which has a very pronounced wet plaster note so will be interesting to compare the two. Bruno Fazzolari did one with a plaster note, too, but I remember a lot more crispness–mint, maybe. Anyway, I’d love to know wha you think of it! The original Narciso Rodriguez for Men (gray bottle, all NR perfumes have similar names, don’t blame me! !! LOL. ;)) has a wet cement accord. The musk and violet leaf combine to achieve it. Love CDG MAN 2 and Odeur 53. Can’t find my Odeur 71(it is around here, somewhere) and the original CDG EDP, I really have to be in the mood to wear. Cloves for days, everyone else smells cinnamon. About the Narciso Rodriguez fragrances–I know! Trying to sort them out is impossible. I adore CdG Man 2, but I don’t really know the Odeur fragrances. The original smells like Christmas to me–deep and spicy. It’s unusual, but not “freaky,” if you know what I mean. I hope to come around and smell it soon. It’s worth smelling, in my opinion! The bottle is great, too. How funny, I just bought a very discount bottle of Jacomo #2 which smells like modelling clay. Love unusual scents. I have this one and go back and forth on it. I do love its wearable weirdness! So, it does sound wearable, then. That sounds intriguing! Is it hard to wear? It sounds like you have a good track record of loving their work–I bet this one pleases you, too. Great review, Angela. I love the smell of plaster so am excited to try this one! The bottle was pretty clever! I’m quite curious about this, based on your review and the bottle. I tend to find CdGs interesting to sniff but not quite pleasurable to wear. I keep thinking one of them will work for me someday, though. Good point about the bottle. It looks pretty sturdy, but I guess time and wear will tell! This sounds great, both the scent and the bottle! Will definitely order a sample. I am a long-time CdG fan. They often pull off something fascinating, and that’s what keeps CdG fragrances must-smells for me. Oh, thanks for the review, look forward to sampling this! The original CdG was my gateway into niche and I love several from the line, always want to try their latest release; even if it’s not something I love, it’s usually interesting. I haven’t smelled everything CdG has done, but I’d like to. It’s usually so interesting, at the very least. I haven’t tried the Eau de Parfum Blanche, but now I’m curious, too. I don’t smell much in the way of florals here, though. I usually trust CDG to create something interesting, and I loved their incense series. But this bottle looks like a dirty bar of soap with a silver handle. Would it work as a candle scent? It looks more like actual concrete to me, in person, but now that you’ve mentioned dirty soap, I’ll always think of that! I don’t think it would make a great candle scent.